In the 1500s Hernandez de Cordoba and other Spanish conquistadors came to Nicaragua, and well, conquered it as conquistadors do. Nicaraguan mestizo people created a traditional play with characters that represented the Spaniards and also native people: The Spaniards who were in charge, a very tall bewejeled woman (“La Gigatona) who was the woman who came with the conquistadors and a very large-headed dwarf. “Enano Cabezon” was small in stature but very intelligent. 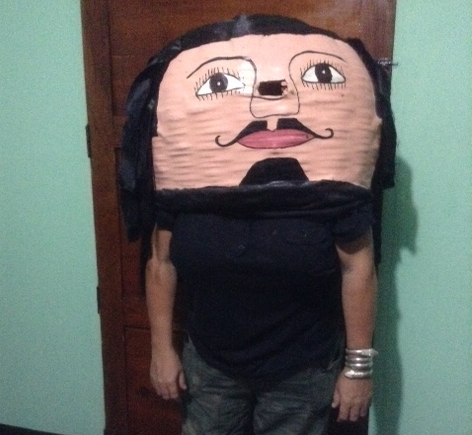 In the plays, and others using traditional people and horse masks, the Nicaraguans were able to satirize the Spaniards to their faces in a time when they had no power. Tomorrow night Enlace Project is putting on a huge concert here in El Sauce – national folk music and revolutionary hero Carlos Mejia Godoy will play as well as Geneseo Professor Glenn McClure. Thousands will jam into the stage area behind the mayor’s office for the show, which includes some cool decorations that George is getting together, like an Enano Cabezon (this one with me in it) and La Gigatona.